Looking for something to do close to your home at Museum Tower next week? Head to the Tower Club on Thursday, August 29 for an Evening of Art. Two up and coming artists, Lesli Marshall and Jonathan Biehl, will be showcasing 20 original works. Marshall, recently showcased in D Magazine for her artwork in Pop Diner, uses her creativity though the use of Mixed Media. Whether it's a large lobby installation or custom piece for a residence, by fabricating different styles Marshall can provide originality for clients, allowing their ideas to come to life. Location truly is everything and at Museum Tower you never have to go far to find a great event. On September 17, the Dallas Art Dealers Association is hosting its Fall Gallery Walk Panel Discussion just two blocks from Museum Tower. This discussion, "Embracing Latino Art," will be moderated by Catherine Cuellar, executive director of the Dallas Arts District. Here's a friendly heads up from Downtown Dallas, Inc. Everyone at Museum Tower is looking forward to the trolley line opening. The info below is important to insure your driving is easy. The intersection of Olive and McKinney Avenue is temporarily closed for contractors to construct the special track for the new McKinney Ave Trolley Olive Street Extension. Originally planned for a 100-store office skyscraper in the 1980s, the 4.7-acre property at Woodall Rodgers Freeway and Field Street was recently sold. The new owner is the Shraman South Asian Museum and Learning Center Foundation, set up by Vinay Jain, a prominent North Texas doctor and medical researcher, and his wife. Tyler Shields is an artists based out L.A known for his work with video portraits and his photography work in the in the art and celebrity form. Moving to a new city is always a daunting task. However, Museum Tower makes moving just a little bit easier. At Museum Tower, the Director of Resident Relations and a knowledgeable concierge staff are on call to make moving in a breeze. With the physical relocation taken care of, you can focus on all the wonderful features and attractions of Dallas. 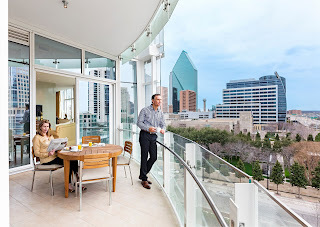 Below find just a few of perks of moving to Museum Tower.